If you love the gloved looks with an abundance of textures, the MSGM fall/winter 2015-2016 collection will be found to be rather appealing. Founding partner of MSGM Massimo Giorgetti has many rumours surrounding him these days, including that he will be heading to Pucci, but presumably keeping his brand. Nothing is confirmed and probably will not be for some weeks yet, but it is certainly out there in the winds and it seems to be a mill amplified by the fact that Giorgetti brought the focus not on his jovial, abstract prints he’s so very well known for, but on the different color blocks and textures that we see so clearly in this collection. Perhaps there is an effort to try and remodel the MSGM brand outlook so that he can apply his creative juices to both projects without one clashing with the other. 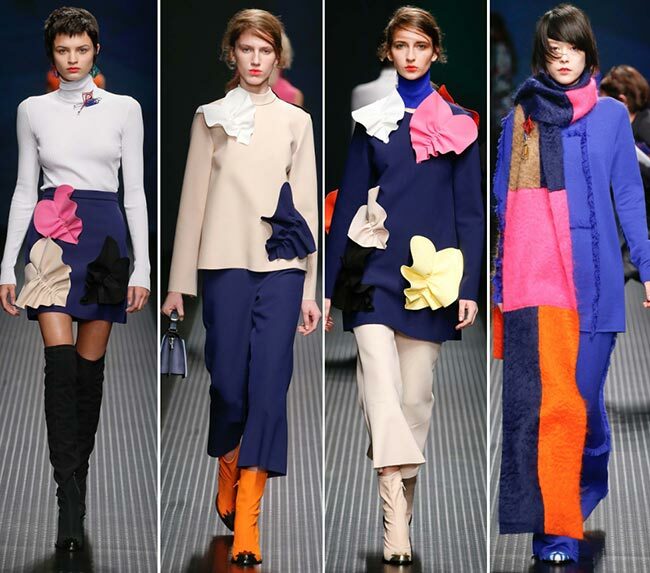 It was in the 1980s that Hasbro Inc. created the spirographs, mathematical roulette toys that have become one form of inspiration for the fashionable line-up seen on the Milan Fashion Week runway yesterday. There are inspirations taken from Merry-go-rounds as well as hypnotic spheres, with 3D earrings and shapes on the garments fashioned after these, embroidered onto the dresses and deconstructed quite nicely into intricate little lacy mini dresses. While there was a feel of a girl in a woman’s skin here, one who refused to grow up, the one just not ready yet to tackle the world on her own, the playground theme and toys allowed her to stay that child in her fashion sense as well, further accentuated by the color palette that reminds us of those artist packs from childhood with the crayons and the pastels, the chalks and the mock paints inside. While the theme may have been slightly more little girlish, the quality of the pieces presented was undoubtedly superior in artisanal creativity and design. 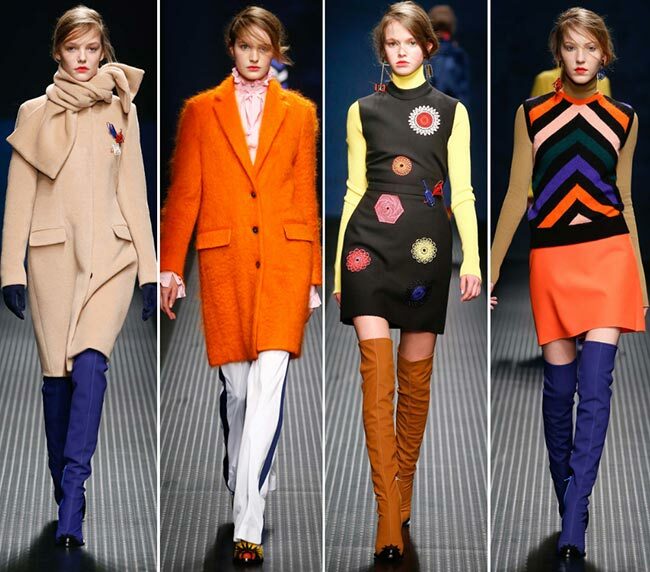 Shocking pinks and electric orange hues, highlighter yellows and orange red coloring, blues of different shades and a touch of beige, dark forest greens and gentle pastel colors all brought major contrast and vibrancy to the collection. 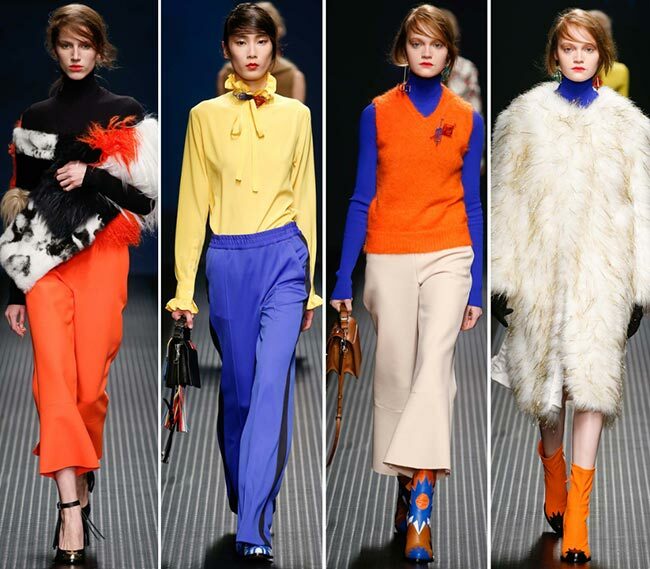 Often the colors were shown of as combinations on a single garment such as on a mohair coat with extra-large pockets or Mongolian lamb chubbies with a patchwork design. There were even a few extra-long mohair scarves in the mix, which though quite pretty, might be irritating for those with sensitive skin. 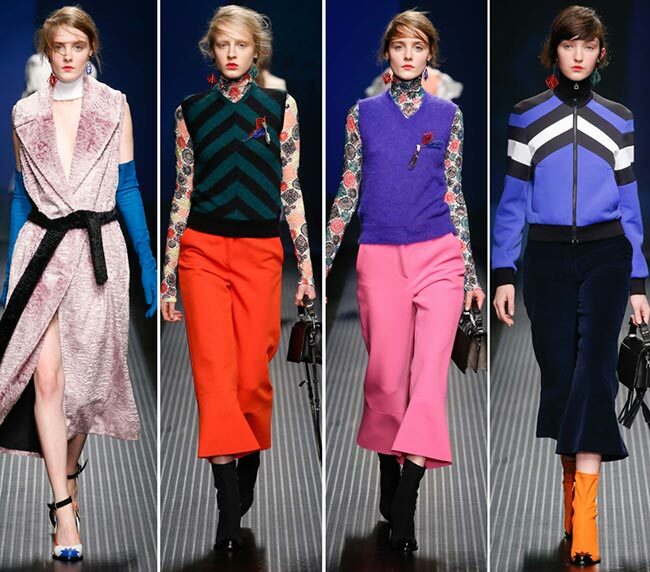 V-neck vests have officially become another trend sweeping through the fall and winter ready to wear collections, while the lace on tops with high-water flares have been around for a while now. 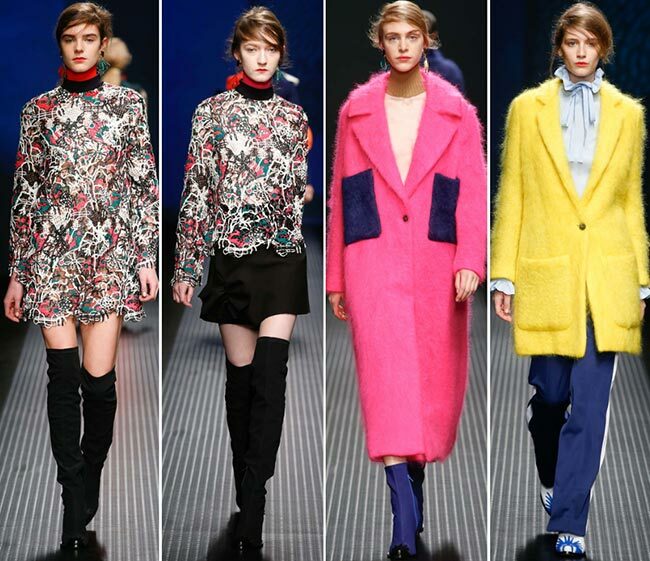 We certainly love the slim tailored coats though and look forward to feeling their textures in stores soon enough. Those with the wrapped-tie necks certainly hold a certain chic appeal in any case so we might be treating ourselves to one of these lovelies soon enough. “The leather lace was made exclusively for us and it is interesting because it is a spirograph. 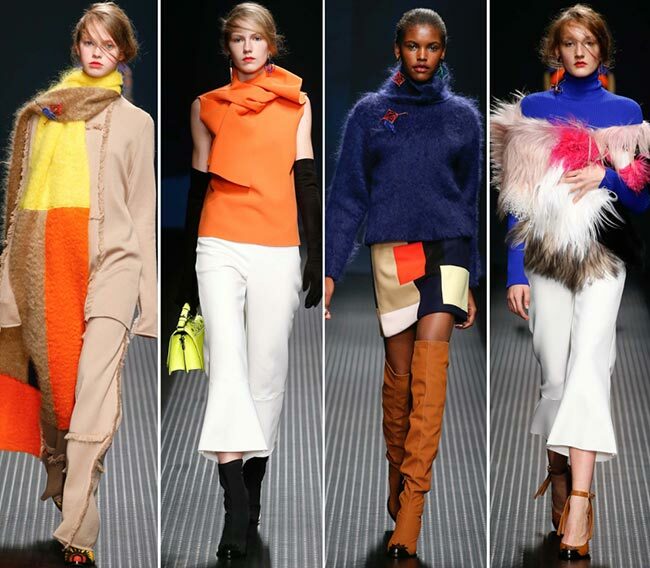 The whole collection is made in Italy ‚Äö√Ñ√∂‚àö√ë‚àö√Ü all our stuff is ‚Äö√Ñ√∂‚àö√ë‚àö√Ü from the sweatshirts to the embroidery,” was Giorgetti’s statement backstage, adding that patchwork was a fundamental aspect of the MSGM fall/winter 2015-2016 collection that strayed so far from the brand’s signature prints. 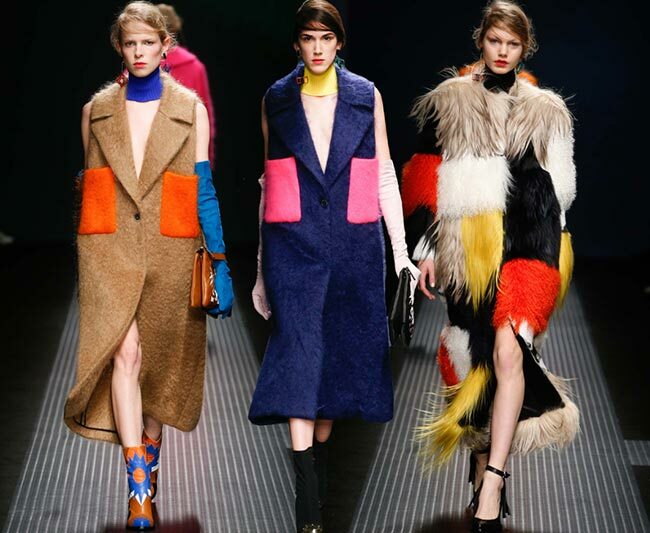 The patchwork includes both wool and furs like astrakhan according to the creative director of MSGM.